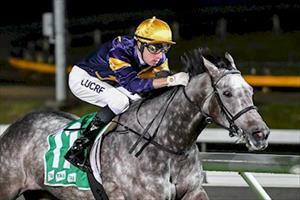 Touch A Cloud showed a touch of class to lead all the way in deteriorating conditions at Cranbourne on Friday night. The three-year-old broke smartly in the 3YO Fillies Maiden over 1400m and Jordan Childs allowed her to roll to the lead and set a steady tempo. Childs asked Touch A Cloud to quicken off the home turn and the filly responded, quickening clear and then staying on strongly to score. Childs said Touch Of Cloud did a good job to win at her second start. “She relaxed nicely for me and was always travelling well,” Childs said. “When I asked her she picked up well and was always the winner. Touch A Cloud is by Glass Harmonium which Mike Moroney imported to Australia and won at Group I level in the Mackinnon Stakes at Flemington in Rupert Legh’s colours with Touch A Cloud bred by Rupert and Cheryl. “I thought that was a solid win and it’s good to get the maiden out of the way,” Moroney said. “She just keeps improving this preparation now that she’s stronger and watching her gallop reminds of her sire, the way he stretched out.